Edward Perez's compositions and arrangements have been performed in venues ranging from the smallest nightclubs to the Kennedy Center, Massey Hall, and Boston Symphony Hall. His works have been performed by such diverse artists as The Silkroad Ensemble, Yo-Yo Ma, Galician gaita powerhouse Cristina Pato, Latin-jazz legend Ignacio Berroa, violinist Johnny Gandelsman, Latin-grammy nominated Peruvian singer Jorge Pardo, oud phenom Kenan Adnawi, and many more. He has written for a myriad of formats from large groups like string orchestra, jazz big-band, and salsa band, all the way down to string quartet, jazz combo, and even solo violin and solo percussion. Suite for Solo Violin Edward Perez's suite "Cinco Danzas Para Violín" will be premiered in February 2017 in St Paul Minnesota by violinist Johnny Gandelsman, best known for his solo performances of Bach as well as his longtime participation in the Silkroad Ensemble and the string quartet Brooklyn Rider. The five movement suite explores the role of dance in five different cultures from different parts of the Spanish-speakng world. The premiere will be part of the 2017 International Spanish Music Festival. (no audio available at this time). "Latina Suite" for the Silk Road Ensemble In late 2015, Galician gaitera (bagpiper) Cristina Pato commissioned a six movement suite from Edward Pérez for her 2016 album, "Latina." Perez was later called upon by Yo-Yo Ma's Silk Road Ensemble to arrange four of these movements for the group with Pato as a featured soloist. They have since performed the suite on at least three separate tours in venues that include The Kennedy Center, Boston Symphony Hall, Chicago Symphony Center, and Massey Hall. The work traces 6/8 rhythms that migrated though Spain and Italy to the the new world in places such as Peru, Colombia and Venezuela. Perez's arrangement for Silkroad includes gaita, piano, string quintet, and three percussionists. Jazz Piano and String Quartet Rising-star jazz pianists Julian Shore approached Edward Perez with one of his works for solo piano and the curious request of arranging the piece for piano quintet, so that his next album could open with the sound of strings. The result can be heard on his acclaimed release "Which Way Now," and a short sample is included here. You can also find reviews on the axs and classicalite websites. Salsa Music for Feature Film Music that Edward Perez arranged, directed and recorded with singer and songwriter Chaqueta Piaggio has been featured on the 2014 Peruvian feature film "Viejos Amigos," directed by Fernando Villarán. The trailer features Perez's arrangement of Piaggio's song "Guajira Pa' Mi Barrio," which can also be heard on Piaggio's album "Espejismo," arranged and directed in it's entirety by Perez. Edward Perez currently directs the Terraza Big Band together with saxophonists Michael Thomas. 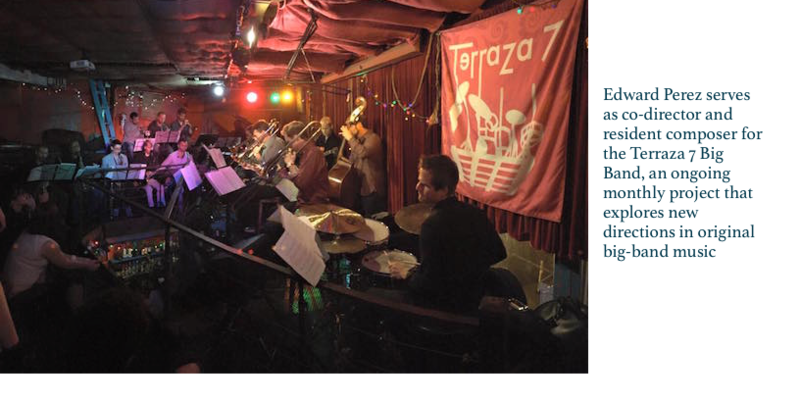 The group performs monthly at Terraza 7 in Queens, NY, premiering new works by both co-directors. Festejation: Peruvian Sounds of New York is one of the very few groups in the US that presents a contemporary take on Afro-Peruvian music. Perez founded the group and serves as arranger and musical director.